Contact us by phone at 863-692-0906 (Eastern Time Zone) or by e-mail at birdsasart@att.net or birdsasart@verizon.net. We gladly accept credit card orders by phone 8am till 9pm. You can use the Paypal links on the web site to order anything. Just type in the item(s) and the amount. If using your own Paypal account, please send to either of the e-mail addresses above. Photographic Theme: My favorite images from the recent SW FLA President's Day IPT . Canon 600mm f/4L IS lens with 2X II TC and EOS 1Ds Mark II. ISO 250. Evaluative Metering -1/3 stop: 1/800 sec. at f/13 set manually. This absolutely gorgeous bird in full breeding plumage made our day twice! Birds actively involved in the breeding process exhibit enhanced soft parts colors due to increased hormonal flow. Once I had the correct exposure (verified by histogram check), I set it manually so that variations in framing would not result in a less than perfect exposure. Despite two last minute cancellations, a full complement of 14 (which included 5 repeat customers) joined us in Fort Myers for five great days of fun, photography, and learning. Assistants Robert O'Toole and Robert Amoruso were most helpful, as was co-leader Ellen Anon who wowed the group with her Photoshop session. (See Ellen's MAD-W file here: http://www.birdsasart.com/MADW.htm) Even I was impressed with many of the advantages of doing conversions in Adobe Camera Raw. It had been near-freezing just days before the IPT began but we were blessed with pretty much perfect weather. This included two absolutely windless mornings at Little Estero Lagoon where we had our best photographic opportunities. Ding Darling was beyond pathetic. We drove through the refuge without touching the brake pedal once... But do take heart in the fact that refuge management assures us that the ecosystem is much healthier since the water management policies were changed about five years ago. I am still trying to figure out how no birds equals a healthier ecosystem... That same morning we pretty much struck out at Blind Pass where a beach re-nourishment program has resulted in a rather sterile environment. Not one to give up easily, we headed for my last ditch secret back-up spot. After more than half an hour of jockeying the cars around we were told that if we parked where we were that we would all be towed. We gave up, returned to the LaQuinta Inn, and did an extra Photoshop session... Aside from that, we killed consistently (as the images accompanying this Bulletin show). Canon 600mm f/4L IS lens with EOS 1Ds Mark II. ISO 400. Evaluative Metering +1 stop: 1/160 sec. at f/4 set manually. Manual Flash at 1:2 with Better Beamer. Folks on SW FLA IPTs arise way-early on DAY 1 so that they can learn and practice flash-flight techniques in the pre-dawn light. I began with the flash set at 1:1 in Manual Mode but this setting overexposed the white birds at the 1/2 frame distance so I dropped the flash ratio to 1:2. Manual Flash techniques are explained in detail in ABP II. Canon 400mm f/5.6L lens (handheld) with EOS 1DN Mark II. ISO 400. Evaluative Metering +1/3 stop: 1/1600 sec. at f/8 set manually. My old toy lens, the 400mm f/5.6, is still a great flight lens. When coupled with the 1DN I find it extremely useful at the Rookery as the effective focal length of 520mm is great for capturing flight or action. At present, I am unsure of the dates (or even the existence) of a SW FLA IPT next February. Keep your eye on future Bulletins for the announcement. Canon 600mm f/4L IS lens with 2X II TC and EOS 1Ds Mark II. ISO 400. Evaluative Metering at zero: 1/200 sec. at f/14 set manually. With the partial sky background and the soft early morning light, there was no need to underexpose here to save the whites as there would have been an hour later. I was amazed when I saw this one as the adult birds were poorly positioned during the time that I created a long sequence. In the one frame where the two adults were perfectly juxtaposed I was lucky to catch one of the two chicks swallowing a relatively huge fish that had been regurgitated by mom. Canon 600mm f/4L IS lens with 2X II TC and EOS 1Ds Mark II on Panning Ground Pod. ISO 400. Evaluative Metering +1/3 stop: 1/320 sec. at f/8. 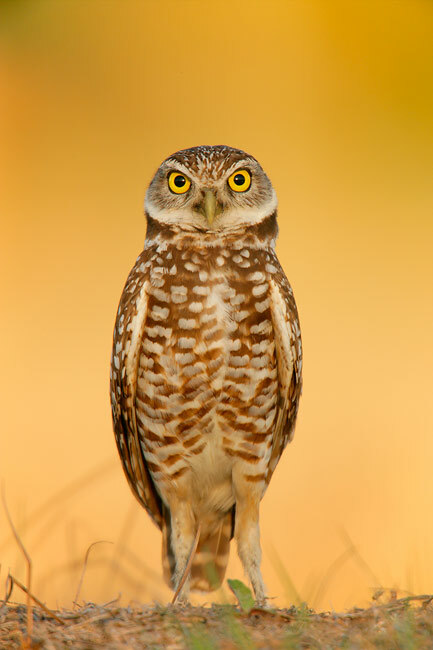 I had just gotten on the ground to photograph this bird's mate (which was standing in a very cluttered spot). It was a miracle that this bird landed just a foot away in a perfect setting. Moments after I created this image the beautiful early evening light was gone with the setting sun... This is my all-time favorite image of this species. 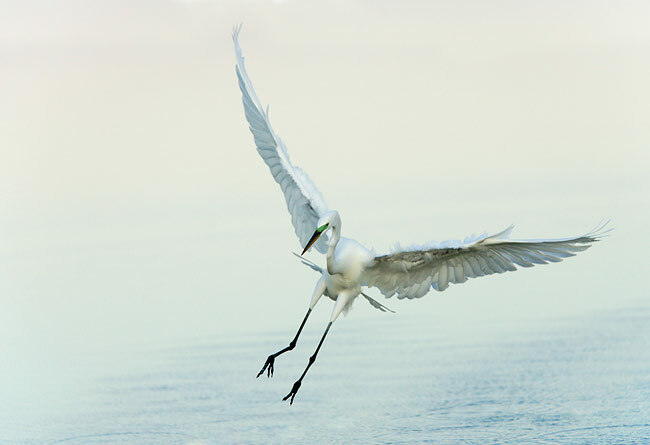 It is most gratifying that we have sold more than 350 pre-publication copies of The Art of Bird Photography II in the two weeks since we announced its availability. The response to the book so far has been totally positive. Canon 600mm f/4L IS lens with 1.4X II TC and EOS 1Ds Mark II. ISO 400. Evaluative Metering -1/3 stop: 1/2500 sec. at f/5.6. With images like this where the subject presents a flat surface parallel to the imaging sensor (or the film plane) 45-point AFPS works well as long as there is sufficient contrast. 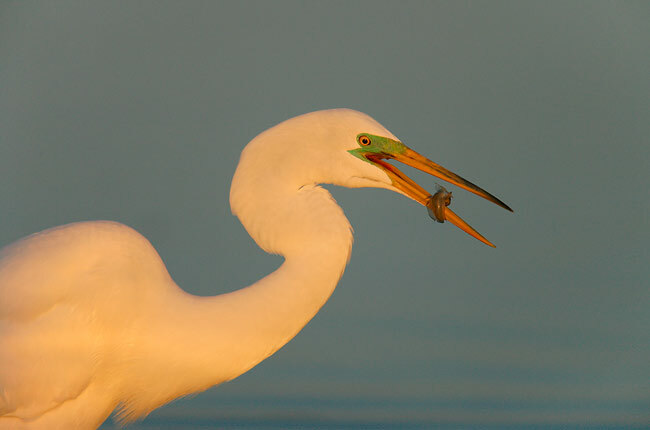 We enjoyed many killer breeding plumage Great Egrets on the SW FLA IPT. You can learn more about Wendy Shattil & her partner Bob Rozinski here: www.dancingpelican.com, or check out their latest book here: Valley of the Dunes. Canon 70-200mm f/2.8 L IS lens with 1.4X II TC (handheld at 280mm) and EOS 1DN Mark II. ISO 400. Evaluative Metering -1/3 stop: 1/1600 sec. at f/8. 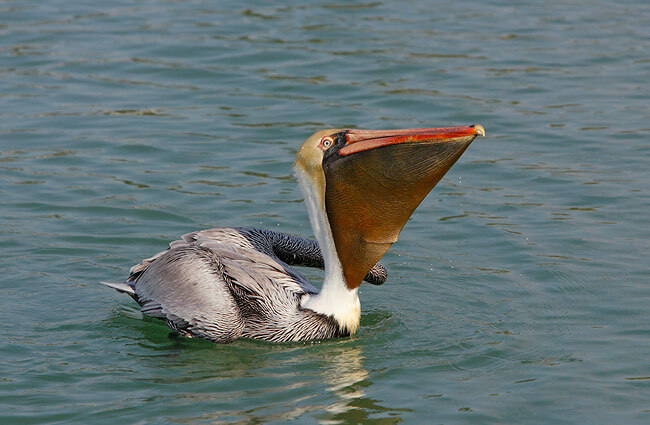 Best to use -1/3 stop on adult pelicans to avoid burning the whites on the neck. The 70-200 with the 1.4 TC was an extremely useful and valuable tool on the SW FLA IPT. I used it extensively at Placida and at Estero. #1: You can copy the CD to your hard drive and enjoy it as is for years to come. This will have cost you $30. #2: You can opt to purchase the final version of the book when it becomes available this spring. The final version will cost $60, but since you purchased the pre-production version you may apply your $20 discount, so the book will cost you only $40 (rather than $60). Those who purchase the pre-publication version will wind up paying $70 for the final version, but they will have access to the information 7-8 weeks before the final version is released. Thus they will be getting the book 7-8-weeks early "for a mere $10.00." I cannot make it any clearer than that... Folks who do choose to purchase the final version will enjoy the 20 pages of additional information that will of course include many brand new images. The final version will also include a foreword written by John Shaw and an elegant CD cover quote from Jim Brandenburg. As many of you know, the book will be an all-new continuation of "The Art of Bird Photography; The Complete Guide to Professional Field Techniques." One chapter covers all aspects of Digital Photography and includes a section on understanding histograms. It also includes our complete digital workflow along with tons of great Photoshop tips. Other chapters will include "Equipment; What's New?," "Advanced Composition and Image Design," "It Ain't Just Birds," "Exposure and Flash Simplified," and "Advanced Sharpness Techniques & Creating Pleasing Blurs." The "Practicalities" chapter will include a detailed section on setting up your backyard for bird photography as well as sections on photographing on safari and on the tundra. Each image in the book will include all technical info as well as our legendary educational captions. Most chapters will include one or more galleries designed to illustrate and reinforce the principles covered in the text. There are two copies of the book on the CD. Open the "Spreads" version to best enjoy the beauty of the images and the layout and design. Open the "Single Pages" version for easy reading. Canon 70-200mm f/2.8 L IS lens with 1.4X II TC (handheld at 220mm) and EOS 1DN Mark II. ISO 400. . ISO 400. Evaluative Metering +1 stop: 1/1600 sec. at f/4. Many folks have written recently asking why I rarely comment on digital noise. Digital noise, somewhat the equivalent of grain in film, is usually evident in images made at the higher ISO settings, especially in dark or black areas of the image. The amount of noise varies with each digital camera; the latest generation models from most manufacturers show vast improvement over their predecessors. With my EOS 1D Mark II, EOS 1DN Mark II, and the amazing EOS 1Ds Mark II, I rarely if ever have a problem with noise at ISO 800 or lower. And neither does Corbis (my image-exclusive stock agency). . When I have an image that shows extensive color noise, that is, green and magenta pixels mixed in with the darkest tones pixels, my first option is to set Breezebrowser's Smart Noise Reduction to "normal" or "high." If I am not satisfied with the results, I try Noise Ninja (http://www.picturecode.com/ ). Both Michael Reichmann and Rob Galbraith rave about Noise Ninja. When comparing noisy images processed with Breezebrowser's SNR and then again with NN the edge might go to one or the other at times, but often the results are quite similar (and often I see no great improvement). But at times, the results can be remarkable. I have recently learned of a new program (Noiseware: http://www.imagenomic.com/) reputed to be totally amazing but have yet to download it... During Ellen's Photoshop session on the SW FLA IPT she showed the group how to use the noise reduction features in Adobe Camera Raw. As with Breezebrowser's SNR, the adjustments are made during conversion. Canon 70-200mm f/2.8 L IS lens with 1.4X II TC (handheld at 185 mm) and EOS 1DN Mark II. ISO 250. Evaluative Metering -2/3 stop: 1/2500 sec. at f/8. 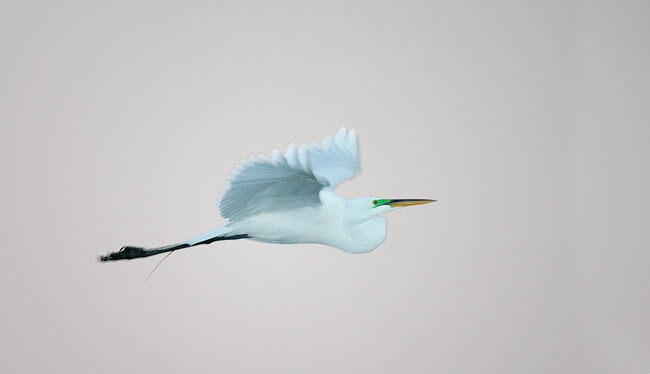 Here, I my exposure was set for Great Egret so I converted the image .2 stops lighter in Breezebrowser. The results were perfect. Again we see the versatility of the 70-200. AF performance with or without the 1.4X II TC is superb with this lens. As predicted, we are effectively sold out of our first allotment of BLUBBs. John Stanford, who sews each bag individually, will be in Australia until approximately April 1. We expect that he will resume production immediately upon his return. We should be getting our next shipment of BLUBBs in mid-April. As with the V-2 Wimberley heads, we will be taking orders for BLUBBs by phone (863-692-0906). We will not bill your credit card until your BLUBB is shipped. Orders will of course be filled on a first come, first served basis. BLUBBS are $100 (shipped empty, no beans included) plus $6 shipping and handling (US Priority mail/signature required). If you would like additional BLUBB information and photos please e-mail us at birdsasart@att.net and request same. Canon 600mm f/4L IS lens with 2X II TC and EOS 1Ds Mark II on Panning Ground Pod. ISO 250. Evaluative Metering -1/3 stop: 1/800 sec. at f/11. Canon 600mm f/4L IS lens with 1.4X II TC and EOS 1Ds Mark II. ISO 250. Evaluative Metering -1/3 stop: 1/800 sec. at f/11. 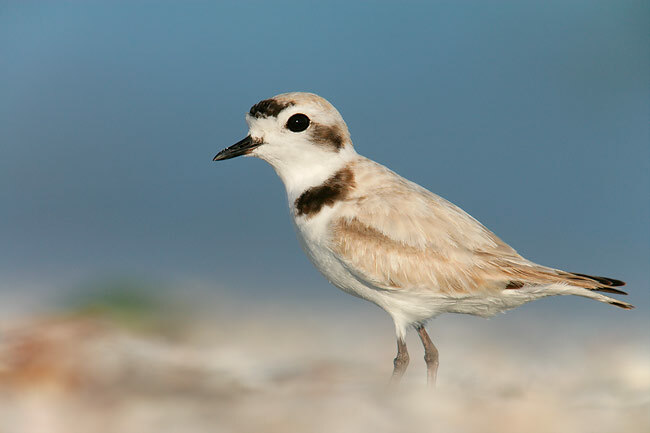 The National Wildlife Federation has drawn up a petition asking the president and Congress to support a strong restoration plan for coastal Louisiana. 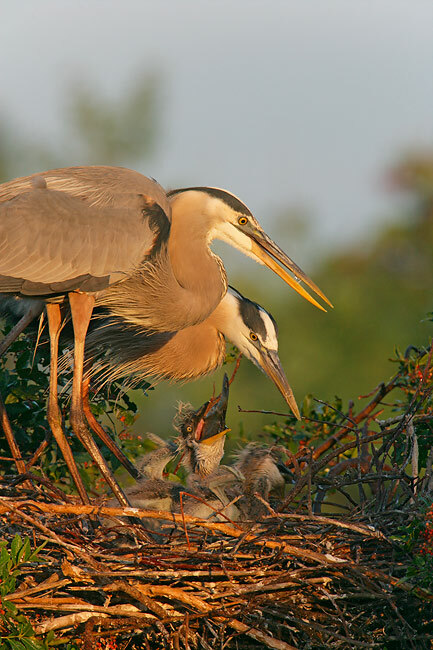 The NWF is working with other groups (including America's Wetland Campaign) to gather as many sign-ons as possible. 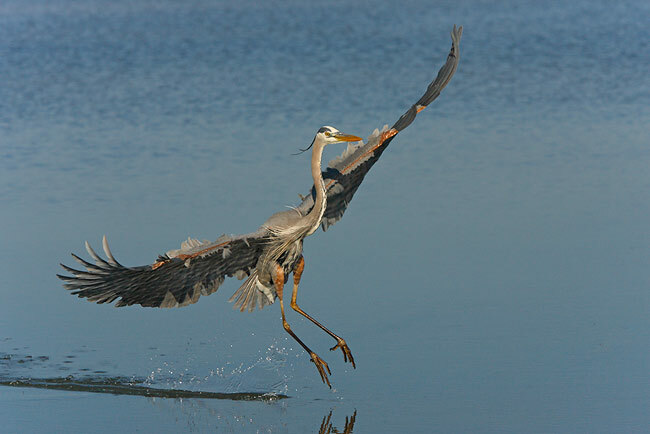 I urge you to click on the following link to add your support: http://action.nwf.org/campaign/coastalwetlandspetition20060218?rk=I1_uQm614QqyW. I did and it just took a minute. Thanks! Canon 600mm f/4L IS lens with two 2X II TCs stacked and EOS 1Ds Mark II. ISO 400. Evaluative Metering at zero: 1/125 sec. at f/16. 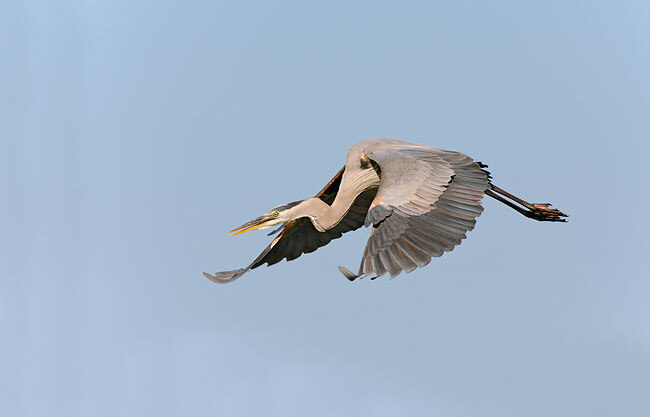 With few birds flying, I was a bit bored when I stopped at the rookery on my way home. I made a series of images with stacked 2X II TCs. This bird was perched atop the colony. I did of course have to focus manually. HOMER EAGLE IPTs, MAR 3-7 and 8-12, 2006. Sold Out/Good to go! 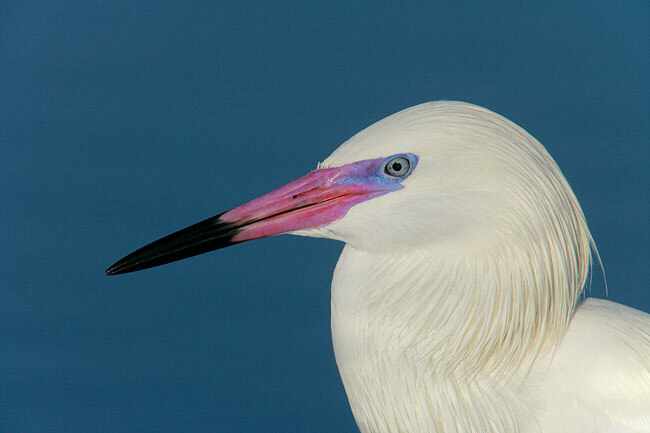 ROYAL & SANDWICH TERNS & LAUGHING GULL (all courtship behaviors), REDDISH EGRET (dark and white forms), AND OTHER HERONS & EGRETS, LONG-BILLED CURLEW AND OTHER TAME SHOREBIRDS SPECIES. ST. AUGUSTINE ALLIGATOR FARM IPT MAY 12-14, 2006. 2 1/2 DAY IPT: $649 (Limit: 12, Openings: 8) Slide Program midday on May 12. HERON AND EGRET ROOKERY. 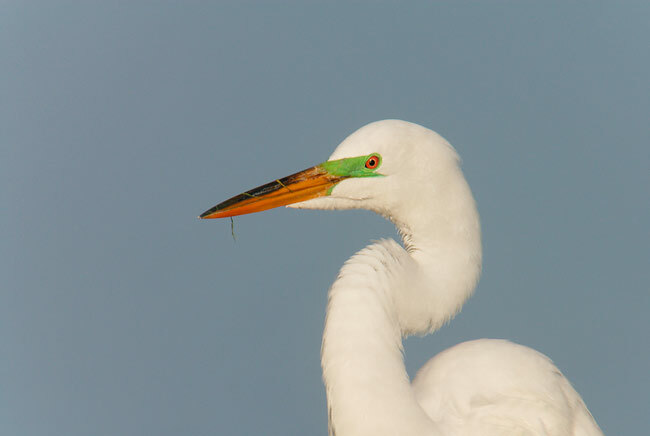 NESTING GREAT EGRETS WITH CHICKS, NESTING SNOWY AND CATTLE EGRETS AND TRICOLORED HERONS. COURTSHIP BEHAVIORS, COPULATIONS, EGGS, NESTS AND POSSIBLY TINY CHICKS. INCLUDES TWO CLASSROOM SESSIONS. GALAPAGOS PHOTO CRUISE/YACHT BELUGA JUNE 30-JULY 7, 2006. We have an opening for either a single female or for two folks traveling together. Please e-mail janie@distinctive-journeys.com for details if you would like to join us. KENYA FLY-DRIVE PHOTO SAFARI, AUG 2006. SAMBURU, MAASAI MARA, AND MORE. With co-leader Todd Gustafson. Leave the US AUG 21. Amsterdam to Nairobi: AUG 22. Amsterdam to US: SEPT 7. $9499 per person (round trip airfare to Kenya not included). Please e-mail for itinerary. Only 4 slots left. Bosque #1: "The Fall Color IPT" NOV 14-16, 2006. Slide Program on the evening of NOV 13. 3-DAY: $929. (Limit 14, Openings: 10) Co-leader Ellen Anon. This IPT should feature a better chance for a day or two of the rare south winds that drastically improve flight photography and will definitely feature the brightest fall-color cottonwoods. Bosque #2: "The Pre-Thanksgiving IPT" NOV 19-21, 2006. Slide Program on the evening of NOV 18. 3-DAY: $929. (Limit 14, Openings: 9) Co-leader Ellen Anon. This and the next IPT have sold out for the past eight years. In 2006 I may once again be hosting a Thanksgiving day luncheon buffet. If it goes, folks will need to reserve a spot and pay in advance. Details TBA. Dinner will be strictly limited to 50 folks. This IPT will feature increasing numbers of geese and cranes with lots of great opportunities. Bosque #3: "The Post-Thanksgiving IPT" NOV 25-27, 2006. Slide Program on the evening of NOV 24. 3-DAY: $929. (Limit 14 Openings: 11) Co-leader Ellen Anon. This IPT has sold out for the past eight years as it is scheduled on dates that I consider peak for Bosque. Seminar: DEC 2-3, 2006. BIRDS AS ART "The Art of Nature Photography; It Ain't Just Birds!" How-To Weekend Seminar in Albuquerque, NM. Details TBA. Folks wishing to combine an IPT with the Seminar should sign up for either Bosque #3 (above) or Bosque #4 (below). Details TBA. Bosque #4: "The Full Moon IPT" DEC 4 (mid-day) through DEC 7 (mid day), 2006. 3-DAY: $929. (Limit 14 Openings: 12) Slide Program mid-day on DEC 4. Co-leader TBA. This IPT includes a half day of photography on the 4th, two full days of photography on the 5th and 6th, and a final half day on December 7th. Limit 14. This IPT has been scheduled to maximize the opportunities to include the rising and setting full (DEC 5) and near-full moon in your images. There will be lots of the usual chances as well, and this time period has provided more than its share of spectacular sunrises and sunsets over the years. Amazingly, we already have 17 folks registered for Bosque 2006. 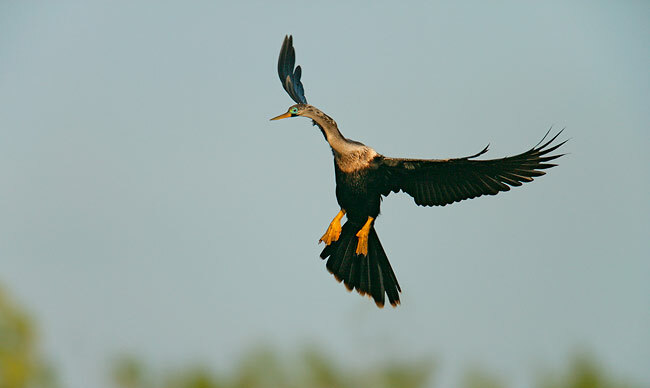 To register for any of the IPTs above, you can send a $200 deposit check made out to "Arthur Morris" to us at: BIRDS AS ART, 4041 Granada Drive, Indian Lake Estates, FL 33855, send us a Paypal (use any Paypal link on our web site), or call 863-692-0906 with your credit card info. Balances due can be paid only by personal check or money order. Canon 600mm f/4L IS lens with 1.4X II TC and EOS 1Ds Mark II. ISO 400. Evaluative Metering at zero: 1/1000 sec. at f/5.6.